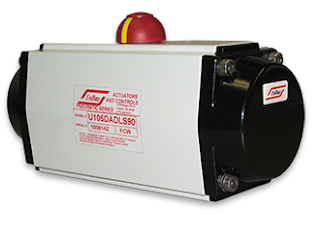 Rack & Pinion actuators are designed for operating quarter-turn valves such as butterfly, plug, and ball valves or for actuating industrial or commercial dampers. In a pneumatic actuator, pistons are attached to the rack. As air or spring power is applied the to piston, the rack is “pushed” inward or “pulled” outward. This dual direction linear movement is transferred to the rotary pinion gear providing bi-directional rotation. Pneumatic actuators have cylinders with pistons and springs that provide the linear movement. When one side of the piston is pressurized with air, gas or oil, the pinion bearing turns in one direction. When the air, gas or oil from the pressure side is vented, a spring (spring-return actuators) may be used to rotate the pinion gear in the opposite direction. 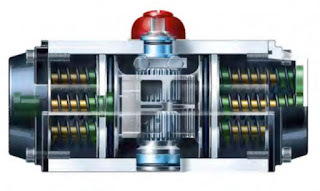 A “double acting” actuator does not use springs, instead using the air, gas or oil supply on the opposing side of the piston to turn the pinion gear in the opposite direction. Pneumatic pneumatic rack and pinion actuators are compact and save space. They are reliable, durable and provide a good life cycle. 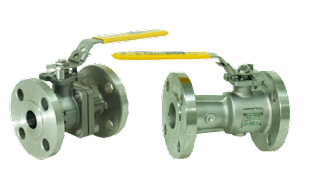 Mechanical wear of the heads and seals are their primary disadvantage. Feel free to contact Piping Specialties, Inc. at www.psi-team.com or 800-223-1468 with any questions you may have about valve actuation.